Wolf Commercial Real Estate, a premier South Jersey commercial real estate brokerage firm that specializes in South Jersey commercial real estate listings and services, is now offering South Jersey industrial space for lease at 1835 Underwood Boulevard Delran NJ. This South Jersey flex space for lease is in the Millside Business Park and this South Jersey industrial building for lease has 16,000 sf of divisible industrial space in South Jersey. The asking lease price for this industrial and flex space in South Jersey is $7.00/sf NNN. This South Jersey industrial space for lease at 1835 Underwood Boulevard Delran NJ is being offered by Wolf Commercial Real Estate, a South Jersey commercial real estate broker with expertise in South Jersey commercial real estate listings and services. This South Jersey industrial building for lease at 1835 Underwood Boulevard Delran NJ has electricity and power availability rated as “heavy” and anyone needing this extra boost will have access to 1000-1000a/120-460v inside this South Jersey flex space for lease at 1835 Underwood Boulevard Delran NJ. 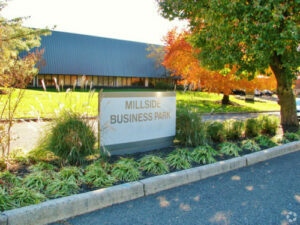 Millside Business Park, in which this South Jersey industrial space for lease is located, is zoned for office, light industrial, and warehouse use. This South Jersey flex building for lease has a number of private offices among its industrial space in South Jersey. This South Jersey industrial building for lease features a bullpen area and interested parties also will find training and conference rooms in this South Jersey industrial space for lease. There’s also a kitchenette and loading dock area in this South Jersey flex space for lease. This South Jersey industrial space for lease is minutes from the Betsy Ross and Tacony-Palymra bridges, providing convenient access to Philadelphia from this South Jersey flex building for lease that is available through Wolf Commercial Real Estate, a South Jersey commercial real estate broker with expertise in South Jersey commercial real estate listings and services. This industrial and flex space in South Jersey is positioned at Chester Avenue and Route 130, which puts this South Jersey flex building for lease in the heart of Burlington County’s Route 130 commercial corridor. There is a NJ Transit bus line stop nearby this industrial space in South Jersey on Chester Avenue and the business part containing this industrial and flex space in South Jersey is near NJ Transit’s RiverLine commuter rail station in Riverside. For more information about this South Jersey industrial space for lease at 1835 Underwood Boulevard Delran NJ or about any other South Jersey commercial properties for lease, please contact Christopher Henderson (856-857-6337; chris.henderson@wolfcre.com) or Jason Wolf (856-857-6301; jason.wolf@wolfcre.com) at Wolf Commercial Real Estate, a South Jersey commercial real estate broker. Wolf Commercial Real Estate is the foremost South Jersey commercial real estate brokerage firm that provides a full range of South Jersey commercial real estate listings and services, marketing commercial offices, medical properties, industrial properties, land properties, retail buildings and other South Jersey commercial properties for buyers, tenants, investors and sellers. Please visit our websites for a full listing of South Jersey commercial properties for lease through the team at our South Jersey commercial real estate brokerage firm.